Seattle has the best fan support, bar none. It has been said that USA should play all of the National Team games there as that it was so enjoyable to see. The Sounders, therefore, always over-perform at home – having scored 11 goals in three consecutive home victories. Although Seattle sits seventh in the West, although the position is a bit harsh since Sigi Schmid’s team has played 3 matches less than everyone else. But after a slow June they’ll start catching up with 5 matches in July and 5 more in August. D.C. United is now labeled as the worst team of the league. On the road, United is 0-5-2 with 10 goals conceded and just one goal away from home turf. D.C. United come into this match in mixed form. Despite only one win in their last 15 league matches, Ben Olsen’s men have found some form in the cup, winning their last two US Open Cup matches 3-1. Familiar? 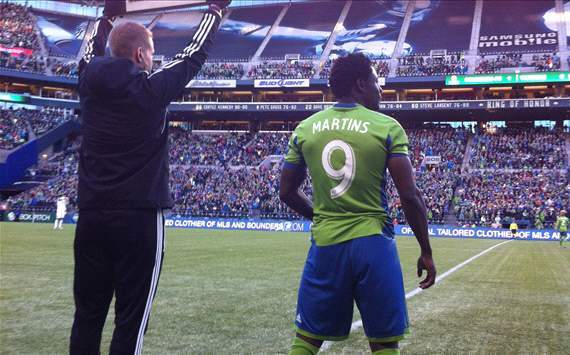 Yes that’s Oba Martins the Speed Monster! D.C. United probable starters: Joe Willis; Chris Korb, Ethan White, Daniel Woolard, Alain Rochat; Sainey Nyassi, Perry Kitchen, John Thorrington, Kyle Porter; Chris Pontius, Lionard Pajoy. Having analysed them fantastic home form by the Sounders, BETEGY had a RECOMMENDED BET on 1X2 HOME WIN for the Sounders. Although various tipsters may suggest in a high-scoring match (over 2.5 bet), BETEGY considers the positive recent form of D.C. United highly. There’s a chance that D.C. will go out there and battle for less goals conceded. Furthermore, Seattle Sounders does not have the best squad due to National Team call-ups and injuries.